The Runnin’ ‘Dog basketball team treated the crowd at Bulldog Pit to their most impressive offensive opener in recent memory Thursday, putting on a first-half show from beyond the arc en route to a 78-43 win over Chaparral. Both teams went scoreless through the first minute-and-a-half of play Thursday before Chaparral’s Gerardo Robledo broke the seal. The ‘Dogs wasted no time responding on consecutive three’s by Devon Torres and Enrique Cosio, but Warriors Isaac Hernandez and Robledo would hit two of their own to keep it close heading into the second, 13-9. A trey with just under seven minutes to go in the half effectively warmed up the shooting hand of 6’7” guard Bryce McAlister, however, and the senior would drop two more in the final 40 seconds, including a long-range buzzer-beater to add to his 19 first-half points. Taylor Null popped one of his own at the 54-second mark, along with an old-fashioned three-point play midway through the quarter, to help see the ‘Dogs to a 33-point period and 46-24 halftime advantage. McAlister kicked off the third with a three and a left-handed layup, Alan Cosio put a shot off the glass, Chaney Hardt hit a trey, and Joe Willingham put back an offensive board to make it a 30-point game, 62-32, going into the fourth. The ‘Dogs forced five Lobo turnovers in the quarter to help limit Chaparral to eight points, and getting their bench involved in the fourth did nothing to slow Artesia down. The final eight minutes played out predominantly from the stripe, with the ‘Dogs going 8-16 to Chaparral’s 1-8, and Nathaniel Zarazua put the game’s final bucket off the backboard to put the mercy rule into effect for the final seconds. McAlister led all scorers on the contest with 26, logging four three’s and going 4-4 from the line. Alan Cosio added 13 and Null 10 for the Bulldogs, while Robledo and Hernandez finished with 19 and 10 respectively for the Lobos. The ‘Dogs shot 51 percent overall from the field to Chaparral’s 26 and were 22 of 33 from the line. “I was pleased with the way the guys played last night,” Mondragon said. “I thought we played extremely hard. I still think we have a lot of work to do in a lot of areas, but one thing that was really nice coming in at halftime is that we had 15 assists to five turnovers. And any time you’re sharing the ball and taking care of the ball like that, good things are going to happen. The Bulldogs (1-0) will now prepare to square off with Gallup at 8 p.m. today in the winners’ bracket semifinals. 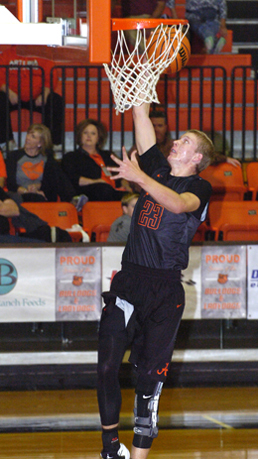 The Bengals edged Goddard 69-67 in Thursday’s first round. “We’re definitely going to have to play a lot better defense than we did last night against Gallup,” said Mondragon. “They’re a good team. Their kids can really score, they’re scrappy, they play hard, and they’re going to be seasoned. That’s one thing we end up saying a lot this weekend – it’s their fifth or sixth game and we’re going into our second, so we have to get better in a hurry and just worry about us.